Fight for What You Believe! 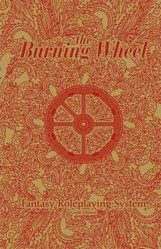 The Burning Wheel is an award-winning fantasy roleplaying game in which players take on the roles of vibrant, dynamic characters whose very beliefs drive the story forward, and whose choices tangibly affect every outcome - from glorious victory to ignominious defeat. The Burning Wheel details solid, dramatic systems for task resolution, advancement, trials of belief, tests of nerve, searing social conflict, dangerous sorcery, miraculous faith, and brutal, gutwrenching martial combat. Behind the dice, player decisions drive the game's systems. Re-edited and revised for clarity and organization, this Gold Edition of The Burning Wheel combines the original two-book format into one, single, easy-to-use volume.